The plaque commemorates the the centenary of the stationery shop. 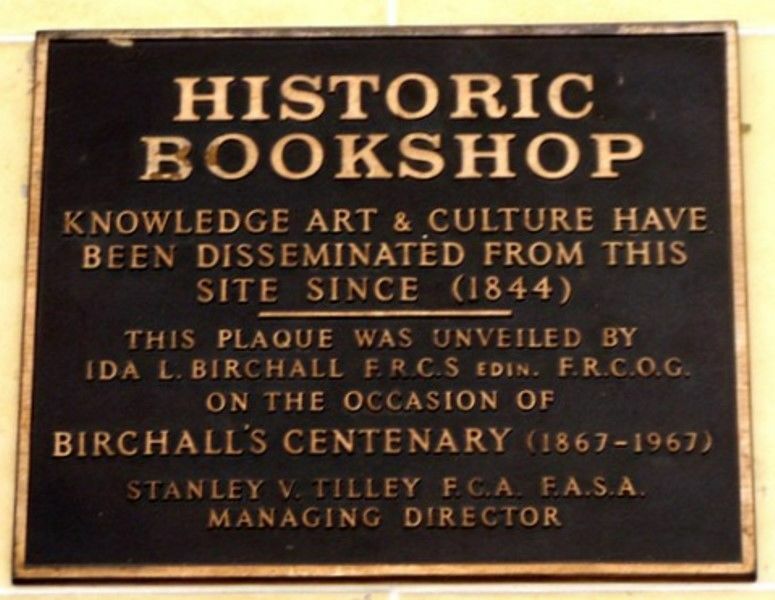 Famous as the oldest stationery and book sellers in Australia, Birchall`s is also noted for its innovative and progressive ideas. One example is the humble writing pad, an idea of Birchall`s. Before production of the writing pad, all writing paper was folded and sold in lots of 24 as a "quire" and fitted into a box which was sold as a ream or 20 quires. This included J.A.Birchall suggesting a more convenient idea that the paper be cut into smaller sheets, packed on a piece of cardboard and gummed together at the top. The suggestion was considered outrageous and rejected out of hand by the directors of the British paper manufacturing Company, Wiggins & Teape. Through the years Birchall persisted with this suggestion and a trial shipment of Silver City Writing Tablets were finally made up and sent out as an experiment. Acceptance by the public was enthusiastic as people started to appreciate the convenient form of new packaging. Sales increased and other manufacturers copied the idea using various types of paper and so the writing pad was born. Knowledge art & culture have been disseminated from the site since (1844).